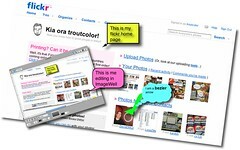 I just noticed and downloaded a mnew version of ImageWell which looks like giving Skitch a run for its money. ImageWell is free with paid extras, I’ve only tried the free version, you could use it for quick editing and upload of photos (dotmac, flickr, webdav, ftp, sftp ImageShack and smugmug supported) but it is the annotation tools that look really good to me. Text, bubbles and shapes can all be added and all support colour and drop shadows. skitch has drop shadow text but ImageWell can drop shadows on the bubbles and lines, Skitch’s arrows look good but Imagewell’s are bezier curves. I could also paste another image onto the first one (the imagewell image on my imagewell pic). The ImageWell Xtras cost $14.95 and adds batch processing and upload and a pile of extra shapes.